"Everyone remembers where they were that day – the day of the event." 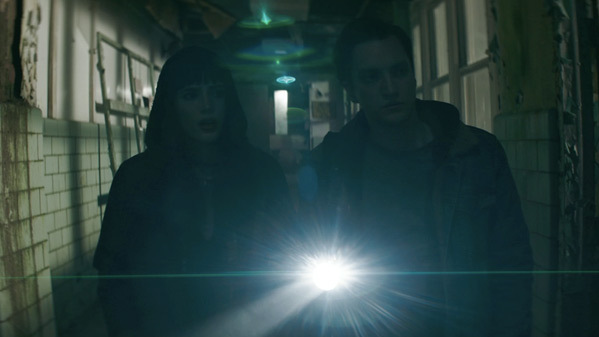 Lionsgate has debuted an official trailer for a strange new supernatural thriller titled I Still See You, adapted from a novel titled "Break My Heart 1,000 Times", which was the film's original title before this newer, simpler one. I Still See You is the latest from filmmaker Scott Speer (Status Update, Midnight Sun) and it has some intriguing things going on, kind of like ghosts but caused by some weird sci-fi event and then the second half of this throws in a few more twists. Bella Thorne stars as Veronica in I Still See You, along with Richard Harmon, Amy Price-Francis, Hugh Dillon, Shaun Benson, Dave Brown, Thomas Elms, Louis Herthum, and Dermot Mulroney. I will say this caught my attention, for sure, I like the sci-fi/horror mix. I'm curious to see more. Bella Thorne stars in this spellbinding and romantic supernatural thriller. Ten years after an apocalyptic event left the world haunted by ghosts, Roni (Thorne) receives a threatening message from beyond the grave. Joining forces with a mysterious classmate, Kirk, Roni descends into a shadow world that blurs the bounds of the living and the dead—and begins a desperate race against time to stop a cunning killer. I Still See You is directed by American filmmaker Scott Speer, director of the films The LXD: The Secrets of the Ra, Step Up Revolution, Status Update, and Midnight Sun previously. The screenplay is written by Jason Fuchs, based on Daniel Waters's novel titled "Break My Heart 1,000 Times". Lionsgate will release Scott Speer's I Still See You in select theaters + on VOD starting October 12th this fall. Who's intrigued by this?